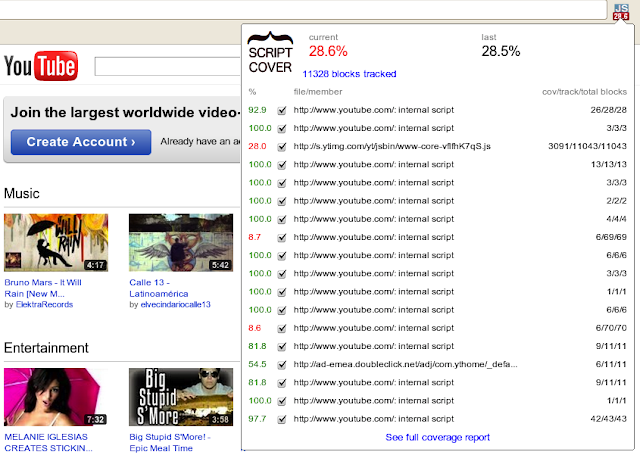 Short report in Chrome extension’s popup, detailing both overall scores and per-script coverage. Recalculate coverage statistics while loading the page and on user actions. Sample of annotated source code from detailed report. First two columns are line number and number of times each instruction has been executed. Easy to use: Users with different levels of expertise can install and use the tool to analyse coverage. Additionally, there is no need to write tests, modify the web application’s code, save the inspected web page locally, manually change proxy settings, etc. When the extension is activated in a Chrome browser, users just navigate through web pages and get coverage statistics on the fly. Want to try it out? Install ScriptCover and let us know what you think. We envision many potential features and improvements for ScriptCover. If you are passionate about code coverage, read our documentation and participate in discussion group. Your contributions to the project’s design, code base and feature requests are welcome! fatal: https://code.google.com/p/script-cover//info/refs not found: did you run git update-server-info on the server? I would really like to give this extension a try! Some of time i try to use this but not got success, but will say it's good information for the java developers for better understanding. Thanks for sharing. Nice blog ? Keep it up..
Is this tool still available? Any links on how to use it?